Many thanks to our sponsor, ElectronicSurplus.com. Check out the large amount of stock they have available for your next project. 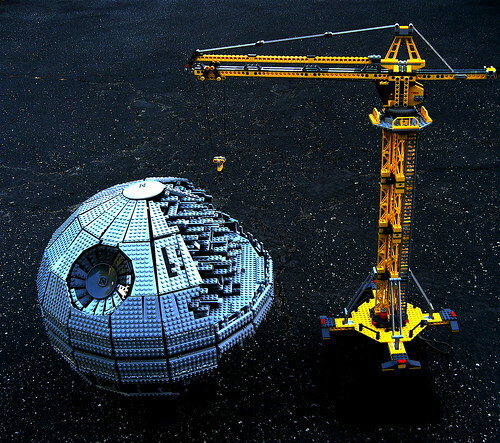 No, the US will not be building a death star. Chris highly recommends this (free!) book on analog system design. Dave references the Aussie classic, Young Einstein. This Kickstarter project selling a dev board and started by a commercial company rubs Chris the wrong way. Congrats to the Raspberry Pi team for selling over 1 million units! Check out our interview with Eben Upton, the creator of the RPi, for more info. Patent trolls have been roaming the lands. One claiming they invented podcasts, many years past the date of their inception; another continually growing and shedding corporate shells (Intellectual Ventures) in order to avoid action against the larger company. Learning takes a long time. Listener Jope suggests this article about learning programming. Learning about chip layouts also takes a long time. This blogger reverse engineered an ST 24C02 sector 17 clock. If you’re into learning about RF, check out this database of circuit designs and start building! Next week we’ll have the CEO and the VP of Engineering from Touchstone Semiconductor. Keep an eye out for the post asking for your questions! hey chris, what kind of mill did you get? im guessing it is manually controlled and you are converting it? unless you bought a conversion kit, you will need to make some mounts for the motor (lots of fun!) i recommend using it a little in its manual state, just for fun. you sure got alot of squares! lol. if you start making highly precise things you should get a micrometer. they are more accurate than calipers. good luck on the cnc build. i look forward to watching more vids. Do you know about this site? They reverse engineered the 6502 and made browser based visual working version of it. Pretty awesome! You can’t just transpose the dimensions for a SMD package designator, for example 0612 to indicate 1206 metric, because some parts have leads on the long edge. Here’s an example of an 0612 current sense resistor. I didn’t grow up in AU, but as a kid, I really like Young Einstein and Reckless Kelly. For the hireadrillsargent.com idea, it quickly came to my mind that GEICO ad that featured R Lee Ermey as a psychologist. Absolutely hilarious!